The home’s front facade has squared-off bay windows and a statuesque two-story front porch. Of course, the journey to this happy ending took a lot longer than it takes to reminisce about it—two years, to be exact. It started with a renovation design team that included George Myers of GTM Architects and George Papaheraklis, president of FineCraft Building Contractors. 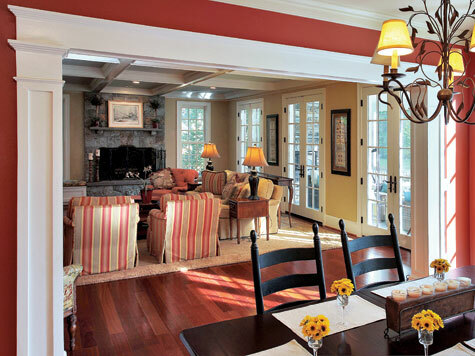 Their job was to enlarge the cramped, outdated center hall Colonial, imparting elegance and convenience and giving the family what Bunny describes as “an easy, family-friendly space” to live in. In its previous incarnation, the house had an unremarkable brick exterior. To reach this goal, Papaheraklis and his team moved the three-foot-wide staircase that originally bisected the entry, widening it and shifting its location to a less central spot in the house. With the staircase removed, the entry became a presence in itself, communicating a grander, more formal sensibility. The FineCraft team dramatically widened the doorways to the living and dining rooms on either side of the entry, and carved a broad hallway leading straight back to the addition. A primary concern was how to transition from the existing house to the addition. The owners wanted the sections to flow seamlessly, and Papaheraklis worked hard to match moldings and create millwork to bridge the spaces. He even conceived a way to make the dark Brazilian cherry floors in the renovated parts of the house complement the old, light-stained oak floors of the existing rooms, by cleverly inlaying a floor design that combines both woods in every threshold that separates the addition from the rest of the house. butler’s pantry, a master suite with a balcony on the second floor and—off the family room—a screened porch (Bunny Lamb’s “favorite room in the house”). Myers’ challenge was incorporating the square footage the family wanted without moving the pool. “The pool limited the depth of the house,” he says. “The constraint was to keep [the addition] shallow.” It now runs the width of the house, and at 17 feet wide, feels perfectly spacious. At one end of the family room, a large wood-burning fireplace clad floor to ceiling in natural stone draws the eye; coffered in a grid pattern, the ceiling adds interest to the space. Beyond the family room, the screened porch is visible, complete with slate floors, comfortable outdoor furniture and a gas fireplace. The staircase was moved from the entry to a less visible part of the house, accessible via a new butler’s pantry. 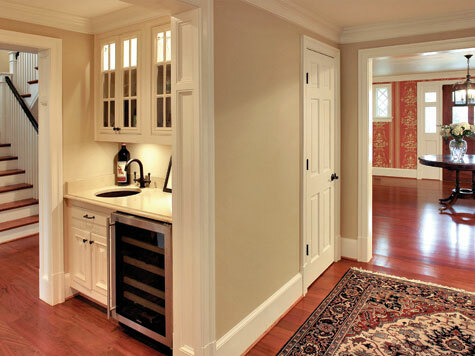 At the other end of the room, a large kitchen offers all the amenities that were missing from its previous incarnation (in a space now occupied by the new staircase and butler’s pantry). For this important family gathering place, the Lambs hired kitchen designer Steve Church of Stuart Kitchens, who helped devise a design that includes an island more than 11 feet long. “I wanted a big island for entertaining and baking Christmas cookies,” says Bunny. Cabinetry from Virginia Mountain Woodworks, quartz countertops, a honed marble backsplash and a host of conveniences such as warming and refrigerator drawers complete the design. The master bath includes a soaking tub and glassed-in shower paved in travertine. Upstairs, Papaheraklis widened the narrow hallway to create easier access to the second-floor bedrooms and the third floor, which now houses the bedrooms of two of the Lambs’ children along with a large renovated bathroom which they share. The master bedroom, his and hers walk-in closets and a spacious bath with soaking tub now occupy the space above the first-floor addition; the former master bedroom in the older part of the house has been consigned as a guestroom. 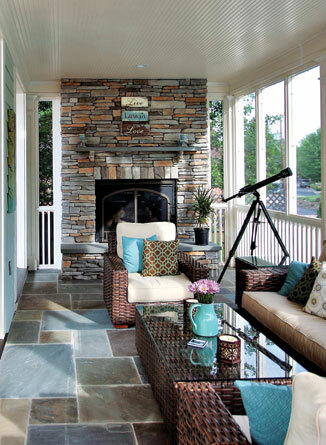 A screened porch provides an outdoor gathering spot well into the cooler months. The final transformation took place in the basement, which originally encompassed a home theater with a coffered ceiling and a game room. The renovation added another, popular basement-level space to the house: an unfinished room big enough for basketball, hockey and even for driving golf balls. “We wanted a place so the kids would want to hang out here, so home would be fun,” Bunny Lamb says. Clearly, the Lambs reached their goal—for the whole family. 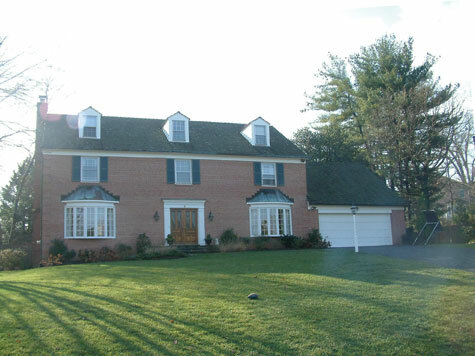 And the house has seen success in another way as well: As winner of a 2010 Contractor of the Year Award for whole house renovation. 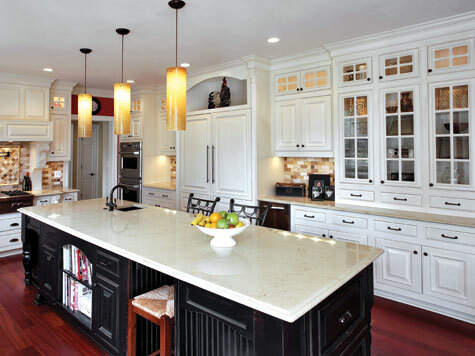 The spacious kitchen is designed around an 11-foot island topped by quartz counters.